The former national publicity secretary of the Peoples Democratic Party (PDP) Olisa Metuh was in tears on Monday as his doctor explained to the judge his health condition. This was during his resumed trial in an Abuja High Court for the alleged diversion of N400 million received from the office of the former National Security Adviser, Sambo Dasuki. The doctor told the trial judge, Justice Okon Abang, why Metuh needs to be flown abroad for treatment. After listening to the doctor, Justice Abang said the court would seek the opinion of the Chief Registrar of the court on the recommendations of the doctor. 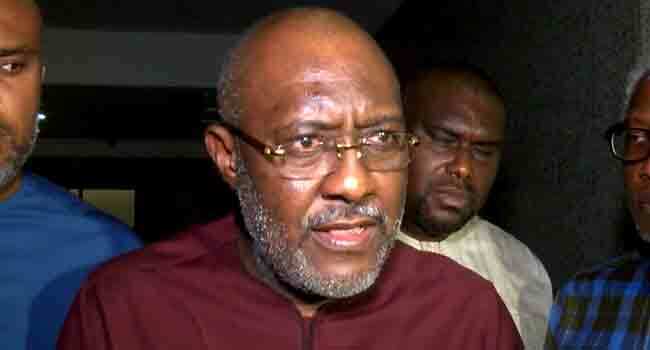 The judge, however, rebuked Metuh’s counsel, Emeka Etiaba, for his ‘rudeness’ to the court. According to him, Etiaba’s refusal to answer some questions asked by the court is compounding issues before the court and is rude. Etiaba had earlier expressed disapproval after the Justice Abang overruled his application for withdrawal of the case. This was after Metuh collapsed in court trying to make his way to the dock. Etiaba said he could not go ahead with the trial with his client lying on the floor. He added that his client is obviously ill and has been confirmed by the medical personnel of the court. The trial judge, however, continued with the trial even though Metuh was still on the floor. He insisted that Metuh’s counsel call his eleventh witness in the trial and also overruled the application by Metuh’s Counsel. According to the trial judge, Etiaba’s application for withdrawal of the case is an attempt to delay the matter. The case was then adjourned to May 22 for the continuation of trial.